I was thinking about what security software I would consider essential when setting up a new home computer. There are a few options that come to mind, but in my opinion WinPatrol is absolutely necessary to have. When I talk with people about it I’m surprised at how few people know about it or use it. I have been using the software for the past seven years and would not feel safe using my PC without it. WinPatrol comes in free and paid-for versions, but the free version does a great job of protecting your PC. 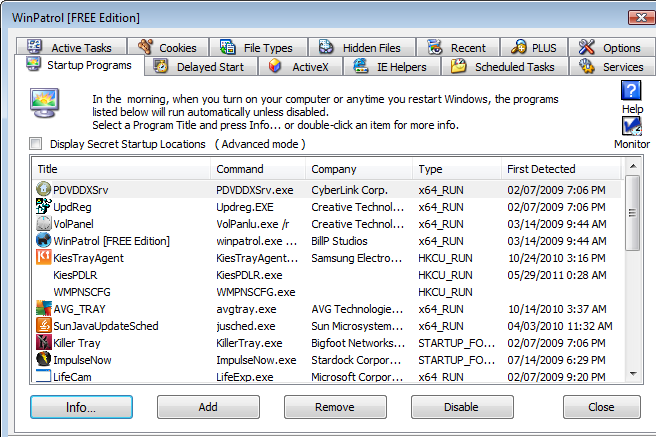 Although WinPatrol has many really cool features, it’s primary purpose is to run in the background as you use your computer. WinPatrol keeps snapshots of important system files and will warn you if malware is trying to modify these files or set itself up as a start up program. Specifically, WinPatrol monitors modifications to the host file, prevents keylogger driver installation, rogue Active X and browser helper objects, and malicious startup programs. Bottom line is: WinPatrol will allow you to stop many malware attacks dead in their tracks before they can even get properly started. Another point that really sells the software for me is that the WinPatrol software is very lightweight and will not hog your system resources. See what IE Helper objects have found their way onto your system. These things seem to multiply on my computer since they are usually hidden and bundled with other software. And quite importantly, the software lets you see a list of programs that have been installed on your computer in chronological order, which is very important when fighting malware infections. The makers of WinPatrol have created a version for Android now as well, so I will be trying it out on my Galaxy S smartphone. I think WinPatrol for Android is a great idea since it is very lightweight compared with standard AntiVirus software (which is quite bulky and resource intense). If you found this review useful, check out another review at HireKnowledge.ca written by Ralph, a friend and former co-worker. Thanks for the heads up on WinPatrol. I don’t run Windows often enough to pay much attention to anti-virus software, but it might be worth a look if I start to use it more. I’m running Linux more than 99% of the time, and Clam is good enough for scanning the occasional file so I won’t be a carrier of something that might affect a Windows machine. I have been using WinPatrol for years now and I do like that it brings control back to the user for what is running on a machine. Too often these days the operating system tries to abstract more and more of what is happening behind the scenes from the user to make the interface seem more human friendly. I don’t mind that to a degree, but I do dislike that it ends up being that your machine is doing all kinds of things behind the scenes that one really might not need or want. Programs like WinPatrol are nice because they give power back to the user!